Freedom, flexibility and fun; a road trip is the best way to really get away from the classic tourist trails in New Zealand. It’s a great travelling option if you have friends to share the cost with and a desire to be spontaneous. You can make all the stops you want on your road trip to take pictures. Believe us, there’s lots to take photos of in New Zealand. Sure, a road trip is a desirable option for travelling around New Zealand. But the question is: should you buy a car or rent a car? Do you want a car for several months? Plan to take your road trip slowly? Then buying a car is probably your best option, if you’re set on doing a road trip. 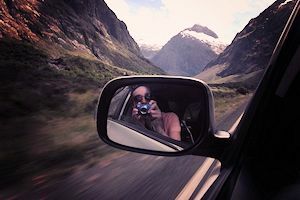 What most Backpackers do is buy a used car, travel around New Zealand with it, then sell it before they leave New Zealand. For tips and more information on buying a car, take a look at our article: How to buy a car in New Zealand. Car rental is a good road trip option if you are planning on hitting the road for two weeks at the most. If you’re travelling mainly by bus in New Zealand, but want to take a side trip, you can still give yourself that freedom by renting a car. Don’t take the rental price at face value. There will be extra costs to pay like insurance. On the topic of insurance, get insurance for your rental. Your credit card insurance is not enough. Windshield repairs are often not included in insurance, so be careful when driving, especially on unsealed (gravel) roads. If you are under 21 years old, your choice of cars to rent is very limited. Despite the fact that there is a huge difference of price between car rental companies, there is also a huge difference of car quality, fuel efficiency and services provided so make sure to research. Or you can simply ask us. And remember: if you have any questions about buying or renting a car in New Zealand, just ask your questions during your Arrival Orientation!